Blurb: Nineteen-year-old vampire Dawn has led a sheltered life within the confines of her father’s presidential headquarters. Upon being sent on a mission to revamp four goofy misfits into guardians of a peaceful little town of Angel Creek, Dawn believes that all her dreams have finally come true. What starts off as a simple task, turns into something unexpected, changing Dawn’s life forever and leading the action-loving, thrill-seeking vampire teen on a path of mystery, danger and intrigue. A sharp, searing pain pierced through my chest as I watched the guy I liked—the guy I was falling in love with—kiss another girl. With every fiber of my being, I willed myself to look away, my vision blurring in a desperate attempt to escape the agonizing scene before me. My body failed to obey; my gaze remained firmly glued to the couple. Powerless, I surrendered to the nightmare, for a brief moment allowing myself to imagine that his muscular arms were, in fact, embracing me. After all, the girl’s face, with its pale complexion, high cheekbones, straight nose and cupid-bow lips, was identical to mine. Her glossy brown hair cascaded down her back, each loose wave perfectly matching my own. Even her slender body curved in precisely the same places. Looking at her was like gazing into the smooth, reflective surface of a moving, breathing mirror. She fluttered open her long, dark lashes, and pulling me out of the fantasy, revealed the one perceptible difference between us: her emerald green eyes. While hauntingly beautiful, they looked nothing at all like my pale violet ones. She stared directly at me, tightening her grip on the only person in the world I had ever wanted to be with—mocking me for being too late. “Aurora,” he whispered in her ear. In that instant, I knew with certainty that he was not thinking about me. About the Author: "Many people sing in the shower. I, on the other hand, write scenes in my head and act them out." In her career as an actress and a writer, Ada currently spends most of her days immersed in imaginary worlds. Much like the characters she enjoys playing and writing about, Ada is a martial artist with a Black Belt in Shotokan Karate. She is also a big proponent of lifelong learning, and has attained Bachelor of Arts in Psychology (it aids in creating characters with unique quirks!) as well as a Master's of Science in Education. Ada strives to bring a fresh voice and perspective to fiction. She has been writing creatively for many years. 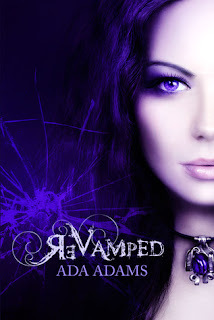 "ReVamped" is her debut novel. Ada Adams will give away one Kindle copy of ReVamped to one reader who comments below (giveaway ends midnight, May 14). Thank you very much for hosting "ReVamped" on your lovely blog today! I would love to read this book. I have heard of it multiple times and it seems really good. I have my fingers crossed. I would love to read this! Thanks for the chance! I really like the cover for this book :) Vampires are my favorite paranormal creature so I'm always on the hunt for more books about them.